The Irish Setter probably came to its own at the end of the 17th century. 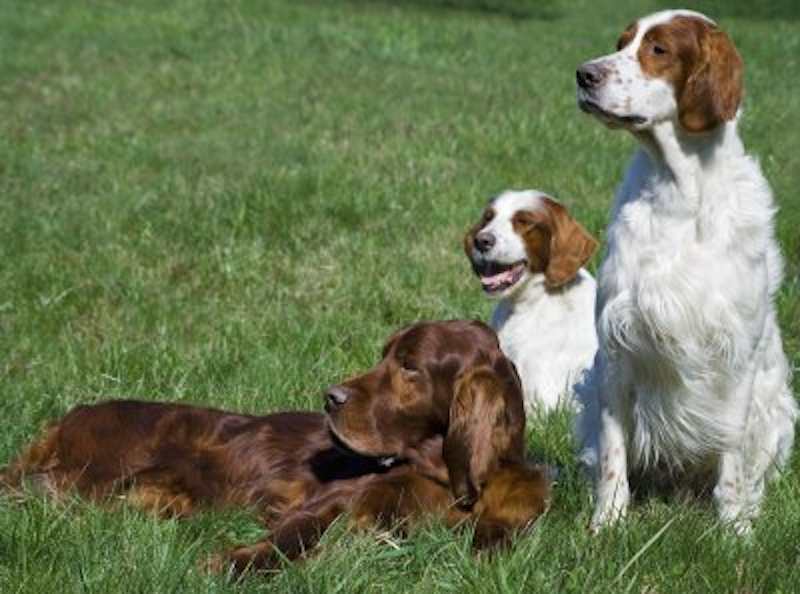 It is not well known outside of Ireland that there are two breeds of Irish Setters, the Red Setter and the Irish Red and White Setter but it is certain that the Red and White Setter is the older of the two, and that judicious selective breeding evolved the solid red colour. When the Irish Setters came to the show benches, just past the middle of the 19th century, there was a good deal of confusion about their proper colour. 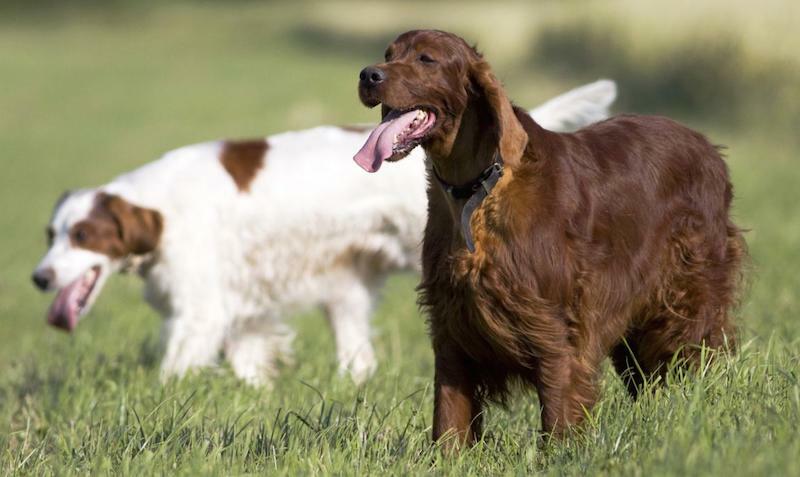 By the end of the 19th century, the Red Setter had virtually eclipsed the Red and White Irish Setter, which became so rare, that they were thought to be extinct. During the 1920’s efforts were made to revive the breed. By 1944, the breed had re-established itself well enough to have a club of its own, and today it can be seen in healthy numbers at Irish shows. To hunters the Red and White Setter has been considered slightly superior to the Red Setter because of its calmer temperament, and because it can be more easily seen in the autumn countryside. 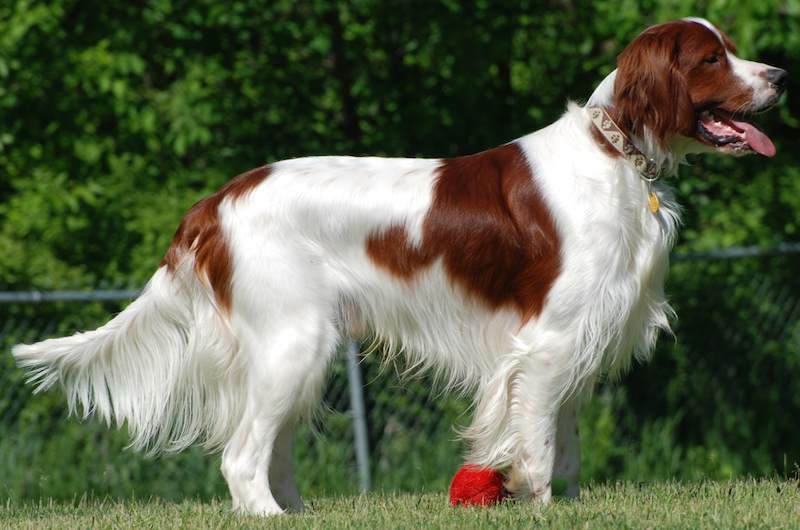 The Irish Red and White Setter is bred primarily for the field. All judges must be encouraged to judge the dogs from the working standpoint. General Appearance: Strong and powerful, well balanced and proportioned; without lumber; athletic rather than racy. 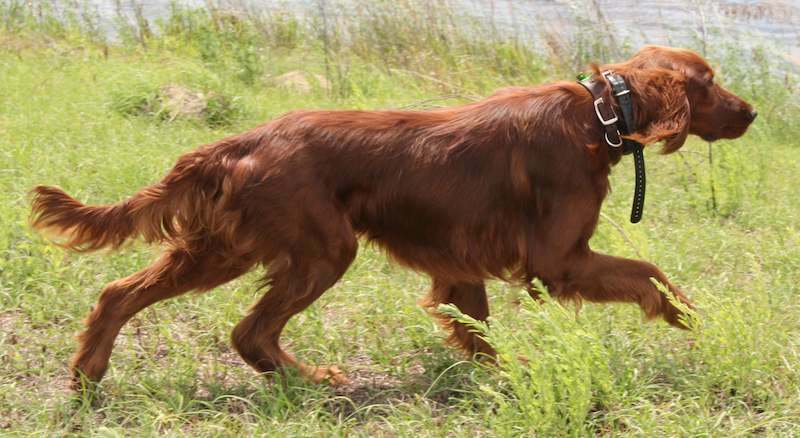 Red Setter: The Red Setter is an active, aristocratic bird-dog, rich red in colour, substantial yet elegant in build. Standing over two feet tall at the shoulder, the dog has a straight, fine, glossy coat, longer on ears, chest, tail and back of legs. Afield, he is a swift-moving hunter; at home, a sweet-natured, trainable companion. He is a rollicking personality. At his best the lines of the Irish Setter satisfy in over-all balance that artists have termed him the most beautiful of all dogs. The correct specimen always exhibits balance whether standing or in motion. Each part of the dog flows and fits smoothly into its neighbouring parts without calling attention to itself. Temperament: Aristocratic, keen and intelligent. Displays a kindly, friendly attitude, behind which should be discernible determination, courage and high spirit. Coat: Long, silky, fine hair called “feathering” on the back of the fore and hind legs and on the outer ear flap, also; a reasonable amount on the flank, extending on to the chest forming a fringe. All feathering straight, flat and not over profuse. The tail should be well feathered. On the head, front of legs and other parts of the body the hair should be short, flat and free from curl but slight wave is permissible. 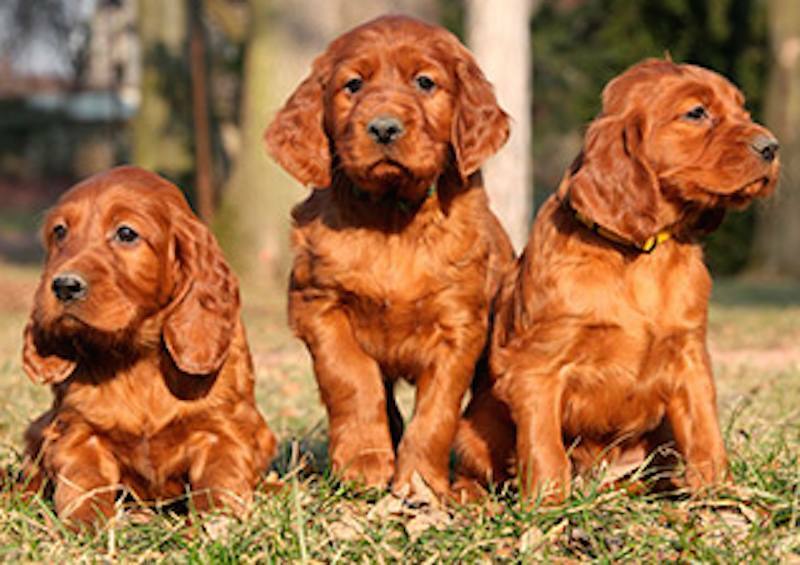 Red Setter colour: Mahogany or rich chestnut red, with no trace of black. A small amount of white on chest, throat, or toes, or a narrow centred streak on skull, is not to be penalized. 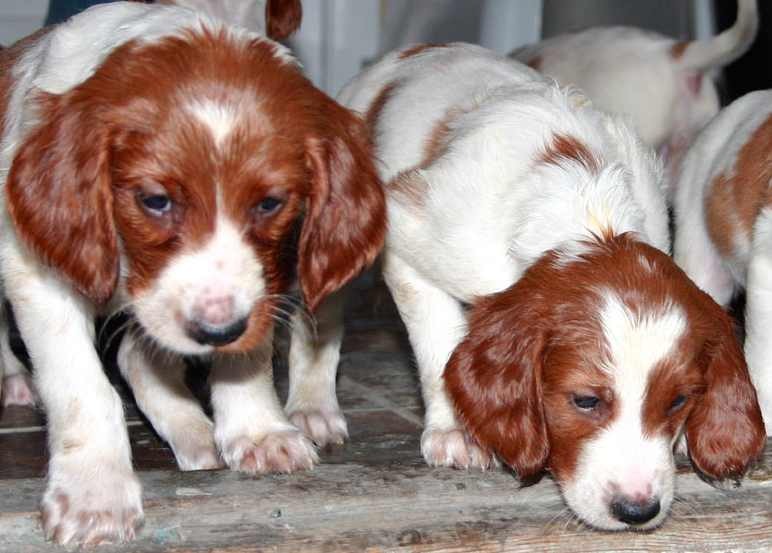 Irish Red and White Setter colour: Base colour white with solid red patches (clear islands of red colour); both colours should show the maximum of life and bloom; flecking but not roaning permitted around the face and feet and up the foreleg as far as the elbow and up the hind leg as far as the hock; roaning, flecking, and mottling that is not excessive on any other part of the body, is permissible, but not desirable. Head: Long and lean, its length at least double the width between the ears. The brow is raised, showing a distinct stop midway between the tip of the nose and well-defined occiput (rear point of skull). Thus the nearly level line from occiput to brow is set a little above, and parallel to, the straight and equal line from eye to nose. Skull is oval when viewed from above or front; very slightly domed when viewed in profile. Beauty of head is emphasized by delicate chiseling along the muzzle, around and below the eyes, and along the cheeks. Muzzle moderately deep, nostrils wide, jaws, of nearly equal length. Upper lips fairly square but not pendulous, the underline of the jaws being almost parallel with the topline of the muzzle. Nose black or chocolate. The teeth meet in a scissors bite in which the upper incisors fit closely over the lower, or they may meet evenly. Eyes somewhat almond-shaped, of medium size, placed rather well apart; neither deep-set nor bulging. Colour: dark to medium brown. Expression soft yet alert. Ears set well back and low, not above level of eye. Leather thin, hanging in a neat fold close to the head, and nearly long enough to reach the nose. Neck: Moderately long, strong but not thick, and slightly arched; free from throatiness, and fitting smoothly into the shoulders. Forequarters: Shoulder blades long, wide, sloping well back, fairly close together at the top and joined in front to long upper arms angled to bring the elbows slightly rearward along the brisket. Forelegs straight and sinewy, the elbows moving freely. All legs sturdy, with plenty of bone, and strong, nearly straight pasterns. Body: Sufficiently long to permit a straight and free stride. Topline of body from withers to tail slopes downward without sharp drop at the croup. Chest deep, reaching approximately to the elbows; rather narrow in front. Ribs well sprung. Loins of moderate length, muscular, and slightly arched. Hindquarters: Hindquarters should be wide and powerful with broad, well-developed thighs. Hind legs long and muscular from hip to hock, short and nearly perpendicular from hock to ground; well angulated at stifle and hock joints, which, like the elbows, incline neither in nor out. Feet rather small, very firm, toes arched and close. Tail: Strong at root, tapering to fine point, about long enough to reach the hock. Carriage straight or curving slightly upward, nearly level with the back. Gait: At the trot the gait is big, very lively, graceful and efficient. The head is held high. The hindquarters drive smoothly and with great power. The forelegs reach well ahead as if to pull in the ground, without giving the appearance of a hackney gait. The dog runs as he stands–straight. Seen from the front or rear, the forelegs, as well as the hind legs below the hock joint, move perpendicularly to the ground, with some tendency towards a single track as speed increases. But a crossing or weaving of the legs, front or back, is objectionable.